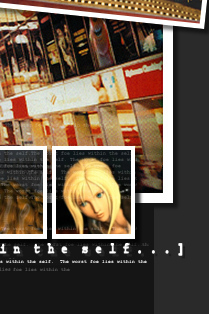 Debatably Parasite Eve's most popular site out there today. Pictures, Information, News and more. Definitely one to have look around. 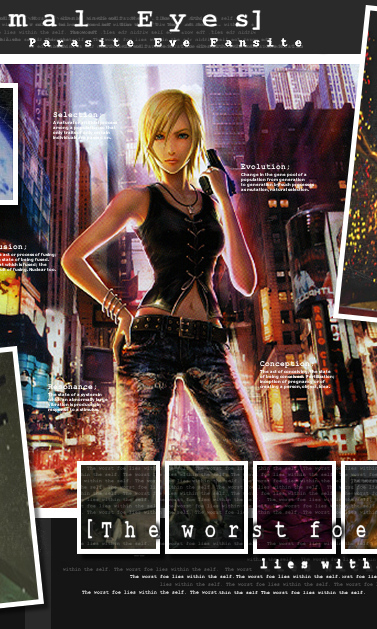 This Parasite Eve site has information, pictures and great scans. A nice site to look into. It also hasn't been forgotten and left for dead. A great site with some lovely artwork, scans, midis and lots ofinformation. Hasn't been updated in a while but has a unique style about it. While partially incomplete in some sections this site offers some really great indepth discussion. It also has a decent selection of pictures and basic information. Has an impressive list of game shark codes for the first game and nice images to compliment its walkthrough. Hasn't uploaded in a while and is exclusively focused on PE1. Interesting 'adoption' program and the layout / graphics have a sense of humor about themselves. No other content and it appears like it died a while ago though. 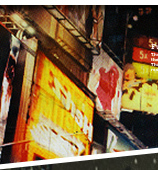 A well loved Spanish site with lots of goodies hidden in its pages. Run by a devoted fan and updated frequently it remains one of the best fansites out there. A beautiful artistic fansite still working on content but well worth having a look. The gallery has some good quality art scans too! A French site that hasn't been updated in a while. It's incomplete but still has a few nice images and a cool layout to look at either way.